Seeing promise beyond the grime and a sinking foundation, one couple restored color and craftsmanship to an 1820s North Carolina farmhouse. Two years after the restoration began, the house was listed on the National Register. 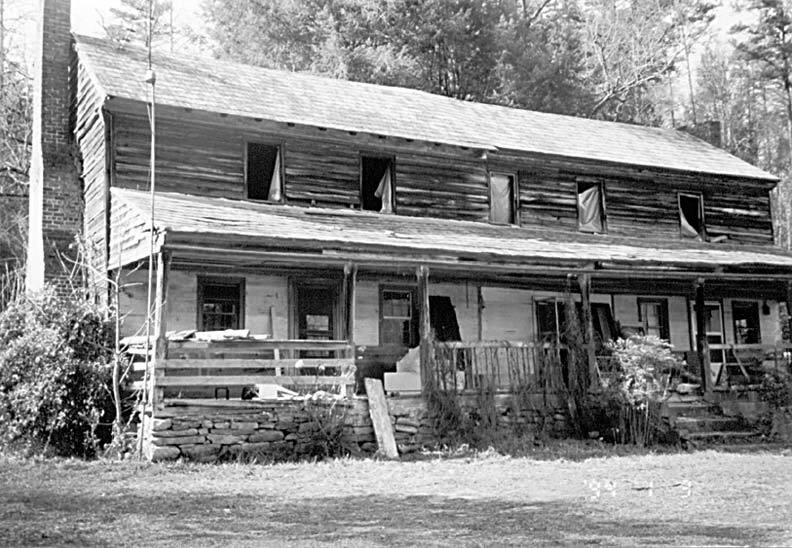 It was a relative who introduced Arthur Campbell and his wife, Zee, to the Albertus Ledbetter House near Marion, North Carolina. The house—built around 1826 and unoccupied for at least two decades—was sunken and filthy, with blown-out windows and junk crammed into all the rooms, and seemed best suited for a training run by the local fire department. But Arthur’s sister Kathy McCullough, who lived just down the road, had found some unusual hand-painted, molded paneling under the home’s grimy exterior, sparking her interest in resurrected the place before it caved in completely. When Kathy heard that the owner had advised his grandchildren to start tearing it down for firewood, she called Arthur and Zee. Arthur, a former airline pilot, and Zee had long been itching to get away from “the high stress lifestyle of south Florida,” as they put it, and find some rural property where they could open a bed and breakfast. So they flew up to North Carolina to check out the Ledbetter House and its surrounding 92 acres of lush mountain woodland. The setting at least, they decided quickly, seemed like paradise. “Our son, Cailein, thought we were absolutely crazy,” says Zee with a laugh. “He said ‘Who in the world wants to live in this old house?’” Cailein, then 14, wasn’t the only doubter. The Campbell’s new neighbors also did a lot of head scratching. When Arthur approached local third-generation Appalachian chairmaker Max Bailey about heading up restoration, Bailey wasn’t convinced it could be done. 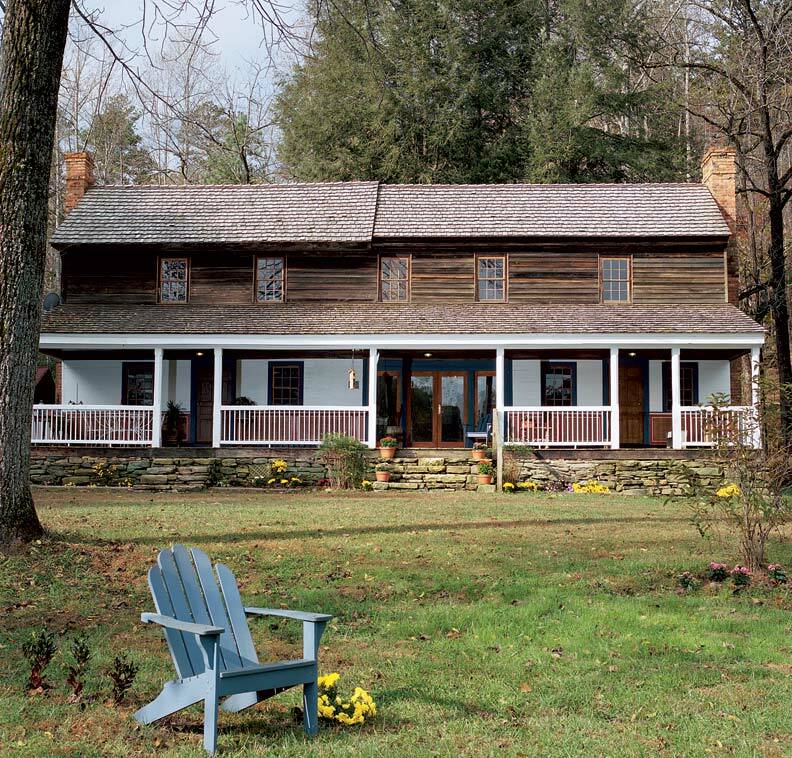 Built as a log house in the foothills of the Blue Ridge Mountains in the 1820s, and then significantly expanded in 1836, the Ledbetter House is a rare surviving example of transitional Federal/Greek Revival architecture of post-and-beam construction. The house was built by Jonathan Ledbetter, a prosperous farmer whose father had fought in the Revolutionary War. Eventually, he passed it on to his son Albertus, after whom the home is named. That makes the Campbells only the third family to own the house in the last two centuries. 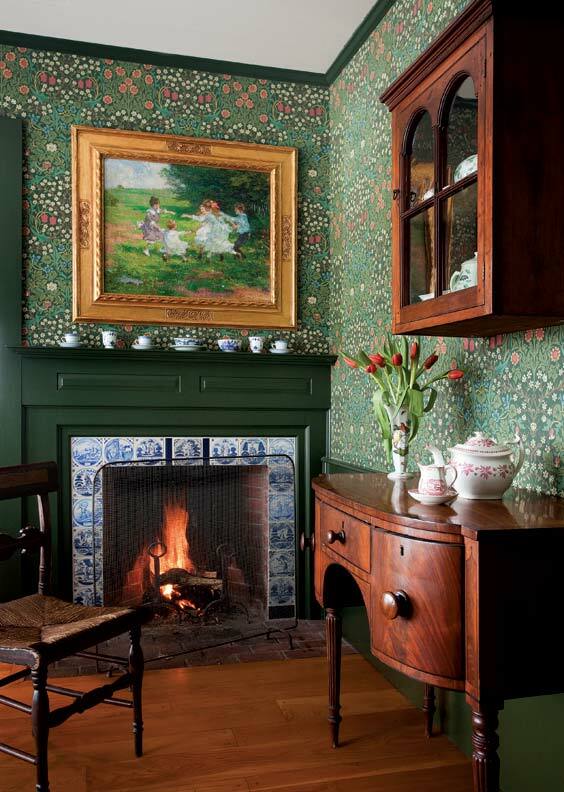 They immediately determined that they would be the stewards of the hand-painted paneling that Arthur’s sister discovered throughout the first floor of the home as well as along the wainscoting on the front porch. 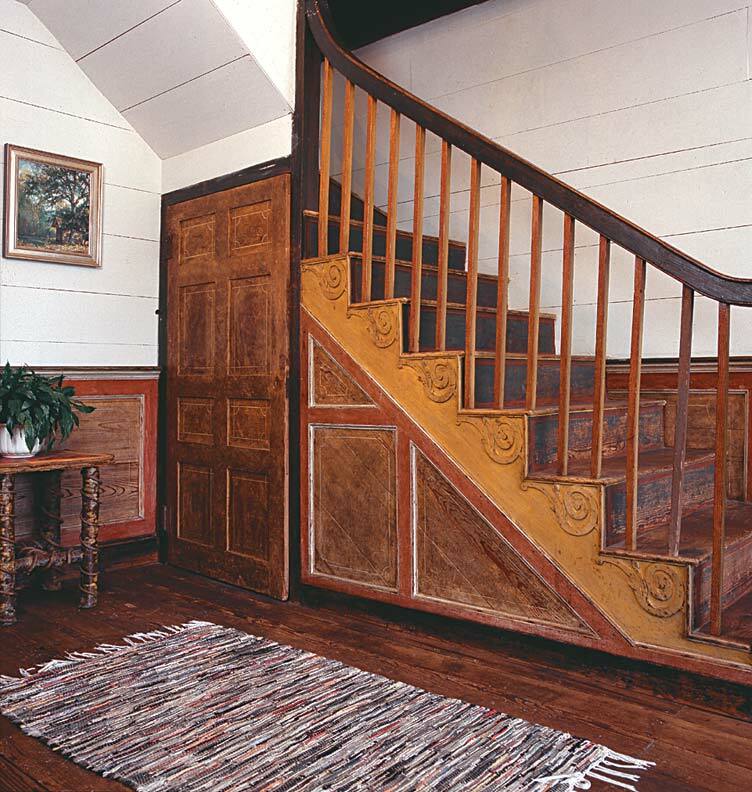 The discovery of hand-painted paneling, highly unusual in a frontier house, may have saved the structure from being chopped up for firewood. Bailey says his biggest challenge was replacing the rotted oak sills that formed the structure’s foundation. With help from his construction crew and Arthur Campbell, he lifted the house with jacks and replaced the rotted sills with new ones made from local locust trees. To keep the house eligible for the National Register of Historic Places, they were careful to preserve original features and to restore others that had been lost, such as a wood shingle roof that had been replaced with tin in 1916. The Campbells used pressure treated pine shakes, recommended by the National Park Service for restoration of Appalachian homes. When removing the house’s tin roof, the Campbells found the original nail holes from the wood shingles and later even found one of the original oak shingles, used to patch a hole in an adjacent spring house. Since the tin was still in decent shape, the Campbells used it to roof a gazebo nearby the pond in front of their home. That’s been the philosophy: When material had to go, it was often replaced with old material recycled from neighboring structures. “We put back everything we possibly could to keep the house as original as possible,” Bailey says. To replace floors and siding, the Campbells used wood from a nearby rundown slave cabin and schoolhouse. What was completely new was electricity and plumbing—the house’s first ever. The restoration was complete in six months. 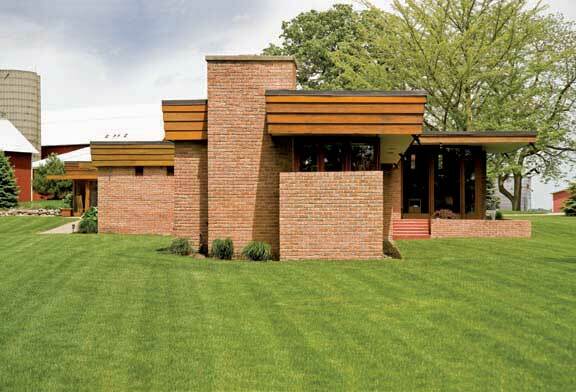 A year and a half later, the home was listed on the National Register. There are two large rooms downstairs, flanked by two fireplaces of original brick and stone. Wood for the "new" floors and siding came from a neighboring cabin and schoolhouse that were collapsing. Once the house was restored, the Campbells followed up on their plans to run a business on the property and began building guest cottages out of local timber. Even the spring house, where they found that original shingle, got a taste of their creative juices. They replaced its ceiling and floor using salvaged wood. Then, to show off the sluice that runs through the house, they created an illuminated viewing area out of Plexiglass. A 300-watt halogen light underneath the glass illuminates the sluice and its rock wall. 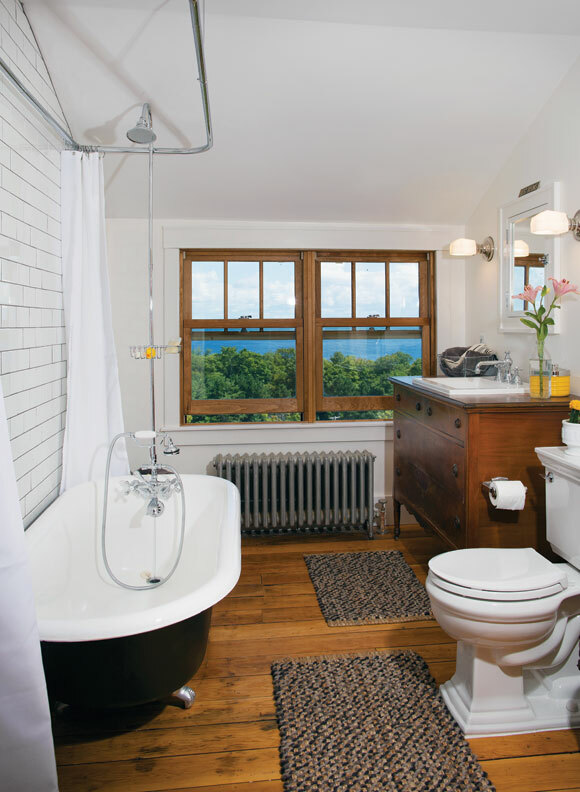 Over the sluice, they used old heart pine to build a 300-bottle wine rack—enough for any number of guests. 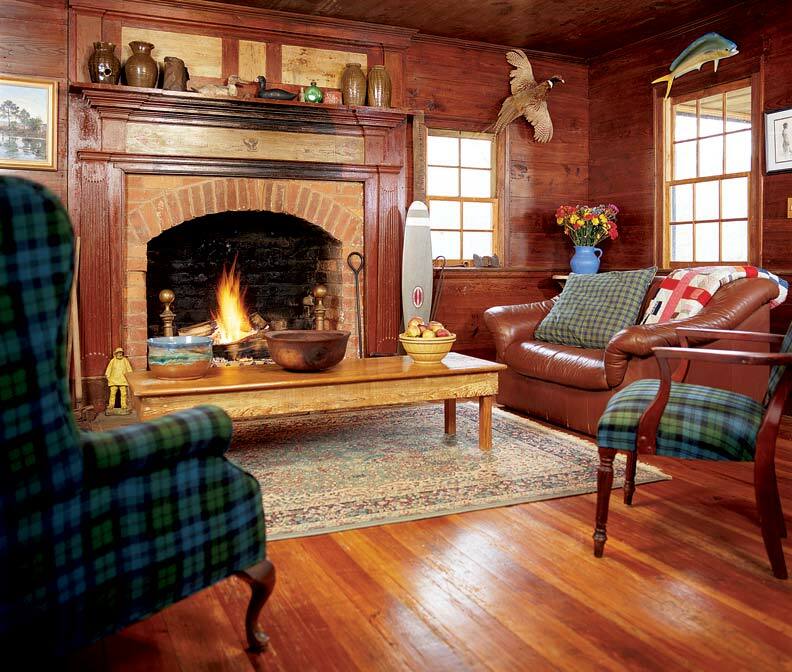 The Campbells opened the first cottage in summer 2000. Today they have five, all secluded among the rhododendron, hickories, and poplars on what they have named Spring House Farm. They bill it as North Carolina’s first eco-retreat, where they’re not only preserving local history, but giving others a taste of the combined culture and nature that led the Ledbetters and now the Campbells to pioneer here.